Facts about Singapura Cat, "Scientific name for Singapura Cat Felis Catus". The "Singapura Cat" which are considered to be bred from cats found in Singapore. The Singapura Cats have brown colored fur with ticked coats. 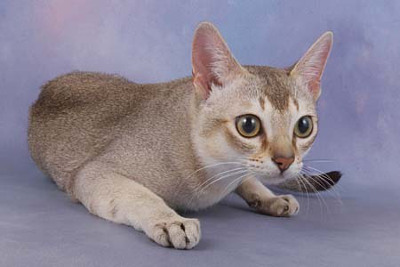 The Singapura Cat are considered to be as a result of mating between the Burmese gene and the Abyssinian ticked tabby gene. The Singapura Cat, there is not much difference in size between a full grown male Singapura Cats and females, a females weighs approximately 5 to 6 pounds (12.7 to 15.2 cm) and males 6 to 8 pounds (15.2 to 20.3 cm). The Singapura cats have bigger ears and eyes for their size. Moreover, they have sepia-toned coats that give them the look of having stepped out of a photograph in the nine-teenth century. The Singapura Cat have silky textured fine coat which is short and dark-brown in color. Their chins, muzzles, belly and chest have their fur color resembling the color of unbleached muslin. Each hair of the Singapura Cats fur, have two distinct bands of light bands that separates the dark ticking and finally ending with a dark tip. The Singapura cat can be small, but not as delicate as their sizes suggests. The Singapura Cat have muscular and stocky bodies with their neck being thick and short. The Singapura Cat have small, oval, short and muscled feet. Their tail is slender, short and has a dark tip. On their faces, the Singapura Cats can look like they have makeup on, with their green or yellow eyes, dark lines extending from the outer corners of their hazel from their brows, dark brown lines around their lips, nose and eyes and the dark brown lines which extends from the corner of their eyes downwards and along the bridge of their noses. The Singapura Cat have their nose leather being pale to dark salmon in color and their paw pads rosy brown. The Singapura Cat are active and can be so mischievous. This can be shown by the way they can climb curtains, chase small balls down the hall, tap dance on key boards or do anything that can place them on high. The Singapura Cat are considered to retain their playfulness even after their maturity. The Singapura Cat are considered to be so friendly and can be perfect bed warmers during cold winter nights. The Singapura Cats are easy to care for and polishing of their coats with chamois is necessary at least once a week. This makes their coats to be healthy and shiny. Singapura Cats average life span is around 12 to 15 years. The reason why Singapura Cats can squeeze through very small spaces is that they have no collarbone and free-floating clavicle bones that their shoulders are attach to their forelimbs, that's why a Singapura Cat can fit through a hole the same size as its head and they use their whiskers to determine if they can fit through the space. The scientific name for cat "Felis Catus". The fear of cats "Ailurophobia". Singapura Cats on average sleep 13 to 14 hours a day and when they are awake, the spend a lot of time licking themselves to keep themselves clean. Singapura Cats help control rodents like small rats and mice where they live such as farm homes, warehouse their houses ect. Singapura Cats can see at levels of light six time lower than a human, this is why cats can catch mice so easily at night. Singapura Cats outer ear uses 32 muscles to control it, and a human has only 6 muscles in its ear and a Singapura Cat can move its ears 180 degrees. A cat can move their ears independently. A Singapura Cat rubs against a person to not only to be affectionate but also to mark out its territory. A Singapura Cat does not like water because its fur is not insulate it well when it gets wet. A Singapura Cat averages about 12 whiskers on both side of its face. A Singapura Cats jaw can not move sideways, there for a cat can not chew large pieces of food. A Singapura Cats back is highly flexible because of its 53 loosely fitting vertebrae. The body of a Singapura Cat has 230 bones. While a human body has 206. Compared to a humans who only have 34. The average Singapura Cat temperature of a cat is 101.5 °F. The Singapura Cats heart beats at 110 to 140 a minute, That is almost twice as fast as a human heart. A Singapura Cats has 30 teeth while a kittens has about 26 teeth that they will lose at about 6 months of age. A Singapura Cat has the ability to jump up to six times its length. A female cat is called a "queen or molly", male cat is called a "tom" and the name "clowder" is called a group and young or baby cats are called kittens. Cats have very sharp hearing and their sense of smell is fantastic. The cat's hairball is called a "bezoar" (meaning a concretion or calculus found in the intestines or stomach of certain animals, in particular ruminants, formerly alleged to be an effective cure for poison). A Singapura Cat can climb up a tree well but can not climb head first down a tree, because all the claws on a Singapura Cat paw points the same direction, to get down from a tree, a cat has to back down. A Singapura Cat can run at a top speed of about 30 mph (48.2 km) over a short distance. The fear of cats "Ailurophobia"